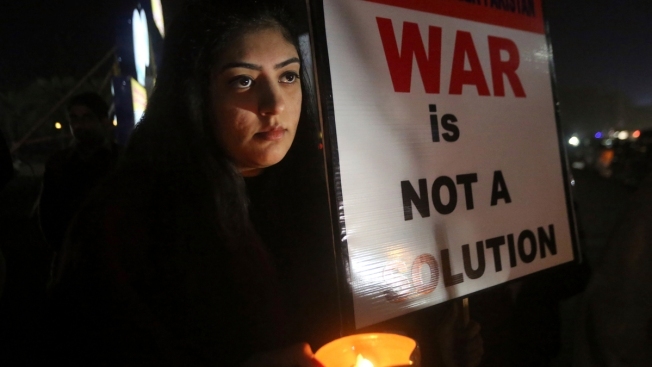 A member of the civil society group, Citizens of Lahore, participates in a candlelit vigil against war, in Lahore, Pakistan, Sunday, March 3, 2019. Residents near the disputed boundary in divided Kashmir region said Sunday it was quiet overnight, their first lull since a dangerous escalation between Pakistan and India erupted last week bringing the two nuclear-armed rivals close to full-out war. Residents near the disputed boundary in divided Kashmir region said Sunday it was quiet overnight, their first lull since a dangerous escalation between Pakistan and India erupted last week bringing the two nuclear-armed rivals close to full-out war. Many villagers used the calm in Pakistani-held Kashmir to leave their homes in Chakoti area along the so-called Line of Control, the demarcation line that divides the troubled Himalayan region on an Indian and a Pakistani sector, and move to safety. Nazakat Hussain said his and many other families have no underground shelters or bunkers on their land to protect them and have no other option but to leave. The rough cold weather and snow, along with the cross-border shooting, prevented them from leaving earlier. Pakistani government official Moazzam Zafar said some 200 families have already taken shelter in three large government buildings in the territory. Zafar said the authorities were providing warm clothing, bedding, food and medicines, and would establish more such camps. At least eight civilians and two soldiers have been killed in Pakistani-controlled Kashmir since tensions soared following India's airstrike last Tuesday inside Pakistan that New Delhi said targeted militants behind a Feb. 14 suicide bombing in Indian-controlled Kashmir that killed 40 Indian troops. Pakistan retaliated, shooting down a fighter jet on Wednesday and detaining its pilot, who was returned to India on Friday. India, in turn, on Saturday handed over the body of a Pakistani civilian prisoner beaten to death by inmates in a jail in India last week. The man, Skahir Ullah, was buried later Sunday in his home village of Sialkot in Punjab province. The rivals struck a cease-fire deal in 2003 but regularly violate it and trade cross-border fire. On Sunday British Prime Minister Theresa may spoke by phone with Pakistan's Prime Minister Imran Khan welcoming the return of the captured Indian pilot and reduction in tensions. But she also urged Khan to crack down on terrorist groups operating in Pakistan, according to a Downing Street statement. "The Prime Minister emphasized the importance of Pakistan taking action against all terrorist groups, in support of global efforts to combat terrorism," the statement said. Associated Press writer Zarar Khan and Danica Kirka contributed to this report.